A range of international case studies from Europe, Asia, Africa and the Americas illustrate the book’s general principles and demonstrate how different regimes influence policy. The rise of the neo-classical discourse of market primacy in housing has left many countries with an inappropriate mix of state and market processes with major interventions that do not achieve what they were intended to do. Remaking Housing Policy goes back to basics to show what works and what doesn’t and how policy can be improved for the future. 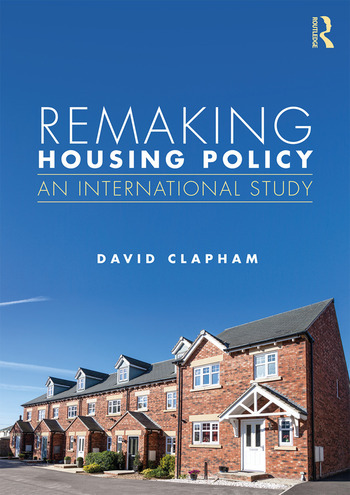 Remaking Housing Policy provides readers with a comprehensive introduction to the objectives and mechanisms of social housing. This innovative international textbook will be suitable for academics, housing students and those on related courses across geography, planning, property and urban studies. Introduction: The Housing Policy Mess 1. The Need for Housing Policy 2. The Objectives and Mechanisms of Housing Policy 3. An Efficient and Balanced Market 4. Quality Houses and Homes 5. The Quantity of Housing 6. Distribution and Affordability 7. Housing for Low- Income People 8. Neighbourhoods, Social Segregation and Social Cohesion 9. Economy and Work 10. What should Housing Policy Look Like?